Malaybalay – Covering more than half of Northern Mindanao and bordered by mountain ranges with picturesque spots, Bukidnon is an ideal place for locals and tourists alike. The fourth largest province of the Philippines is also home to Mt. Kitanglad, a 2,899-meter inactive volcano and the fourth highest peak in the country. Amidst its charms, Bukidnon has also been the home of the Higaonon, the least-known among the seven ethnic groups that dwell in the region. 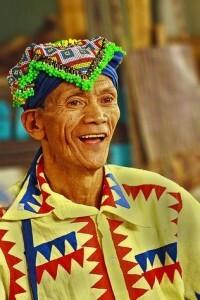 The Higaonon are thought to be the first inhabitants of Cagayan de Oro even before the arrival of the Spaniards. Their name stands for “people of the living mountain,”and they are a peace-loving group who have settled and survived in the forest. The influx of Visayans in the region pushed them toward the Bukidnon highlands. Today, several communities can be found in Agusan del Sur, Agusan del Norte, Lanao del Norte, and Misamis Oriental. The culture of the Higaonon tribe can be best described as one of peace, since they function as intermediaries to solve internal conflicts of other ethnic groups. Most of the members are Christianized, though traditional and common practices are still venerated. Over the years, they have continued to live in the forest and have mastered the protection as well as conservation of their environment. Some have volunteered to be forest guards who patrol and oversee their ancestral domains against illegal loggers. The Higaonon tribe is made up of eight clans concentrated in the vicinity of the eight main rivers of their ancestral domain. Even though much of its population has been converted to Catholicism, tribal traditional practices are still performed such as the ancient ritual called Tampudas hu Balagunor literally, “the treaty of the green vine branch.” It is the customary cutting of a green vine to appease two opposing tribes. One fundamental element among the tribe is their traditional fabric called Hinabol or, literally, “woven.” It is a woven hemp with colorful stripes and distinctive patterns, also known as the “cloth of peace.” It can be used to negotiate tribal conflicts or as a dowry for weddings. Hinabol is a weaver’s expression of her feelings, as colors and patterns will be picked according to the latter’s mood. Hinabol made by the wife of the Datu are considered sacred and are used for offerings. As more and more migrants arrived in the region, the Higaonons gradually lost their means of livelihood, and several others have moved to find alternative sources of sustenance. In recent years, their ancestral land have been abused by illegal loggers, pushing some deeper into the mountains and others into the city. They have suffered discrimination and have been forbidden to legally preserve their ancestral domain. Akin to other ethnic groups in the country, they too are gradually shifting to the modern way of life for their survival. Many children have reportedly lost the ability to speak their language and are oblivious of the tribe’s rich traditions. Not long ago, the Office of the High Commissioner for Human Rights in Geneva invited Arthuso Malo-ay or Datu Pignanawan, as a representative from the tribe to undergo training to raise awareness as well as to be familiarized with international human rights.